It’s ok to admit you might like Star Wars as much as I do. I mean I don’t go around dressed like Princess Lei but I sure get excited for all the new Star War Movies. Growing up, my family were huge Star Wars™ fans. We watched movies 4,5 and 6 over and over again. I remember when the movies were re-released, my mom and I actually skipped from one movie theater to the next. We had all of the moveable plastic characters, some of which I gave to my sons when they were younger. 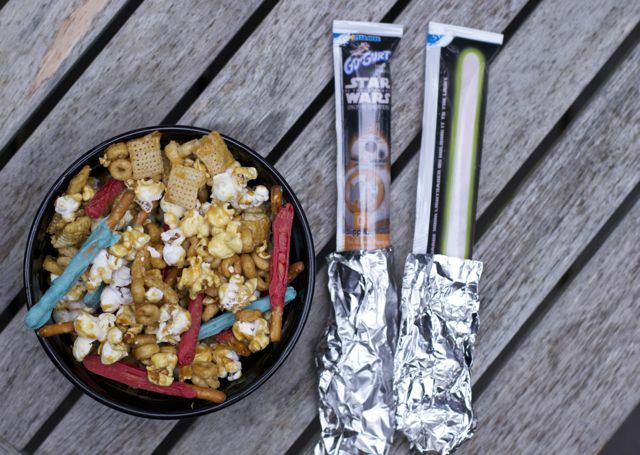 In fact, I think I sort of encouraged my boys interest in Star Wars™, as I threw a Star Wars™ birthday party for one of them and loved creating everything from Star Wars™ invitations to Star Wars™ party food. 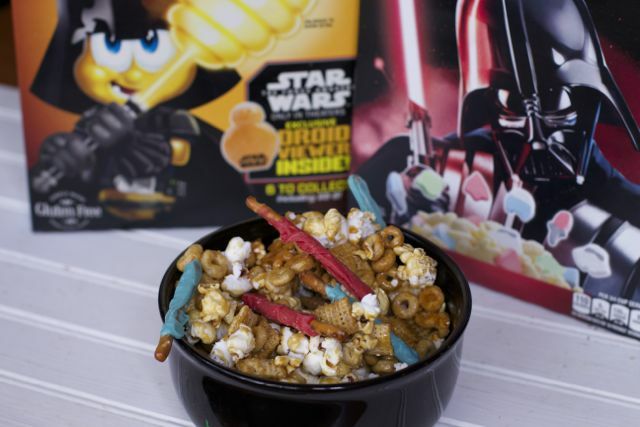 Now that the new generation of movies are coming out, I am trying to bring back their excitement by creating this yummy Star Wars™ Popcorn Mix using the fun Star Wars™ Honey Nut Cheerios®. You would think I was a kid again getting so excited about a movie, but truly, the excitement is spurred by all the new food packaging. 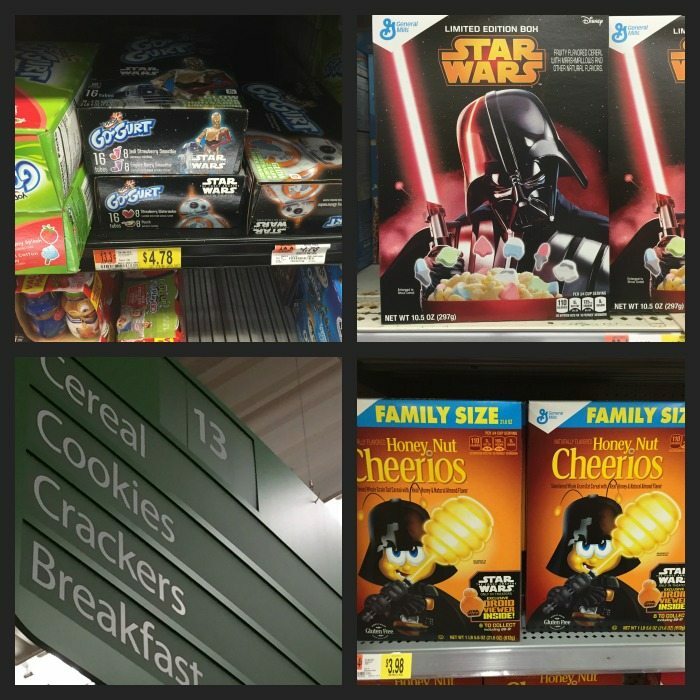 While shopping at Walmart I could not resist the new Star Wars™ Honey Nut Cheerios® and Star Wars™ Go-Gurt—I knew I could really have fun with both of these. 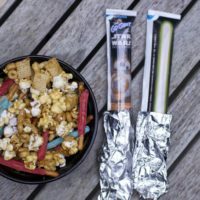 We are already big fans of Honey Nut Cheerios®, so I was thrilled to figure out a fun way to make a Star Wars™ Popcorn Mix Recipe that we could enjoy in anticipation of the movie release. 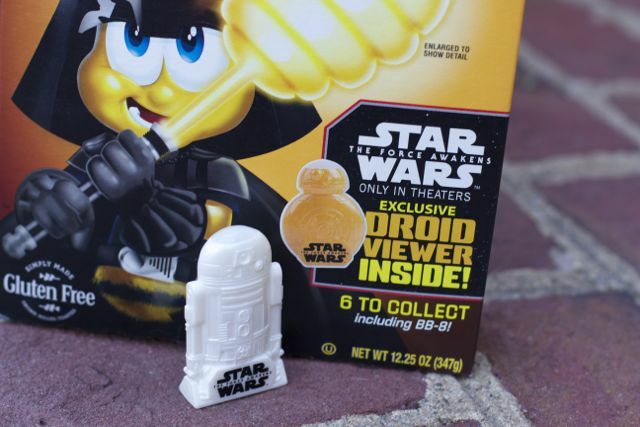 An extra bonus each box of specialty marked Star Wars™ Honey Nut Cheerios® include a fun toy for your kids or you!! 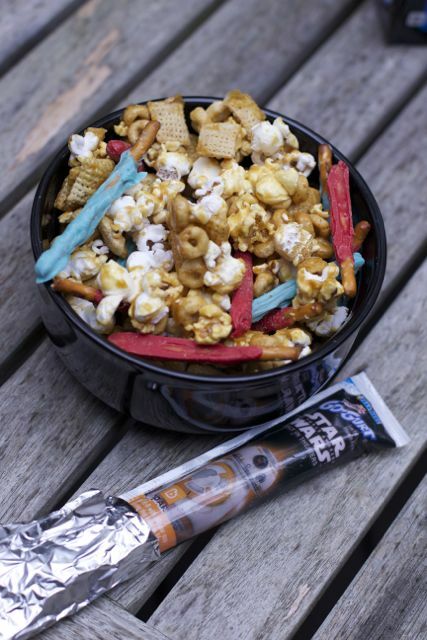 Let’s get moving out of this galaxy and into the Star Wars™ Popcorn Mix Recipe. 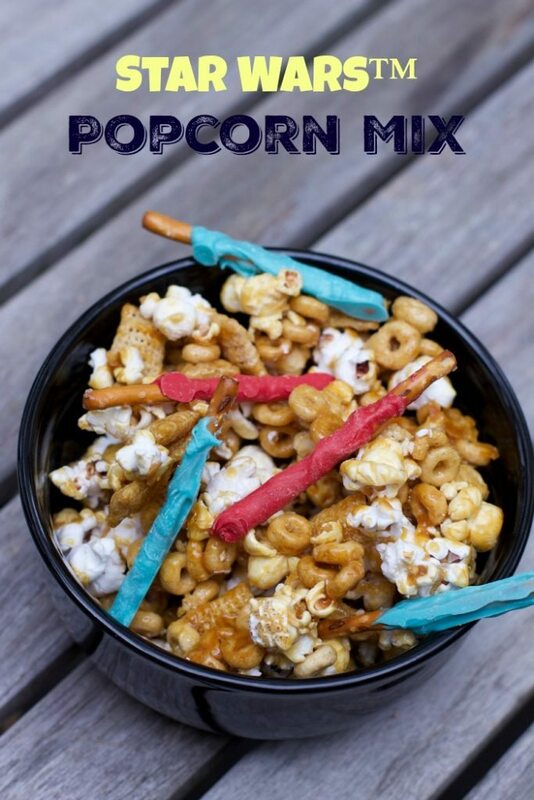 Mix some popcorn, Star Wars™ Honey Nut Cheerios®, and Rice Chex to create the basis for this mix. 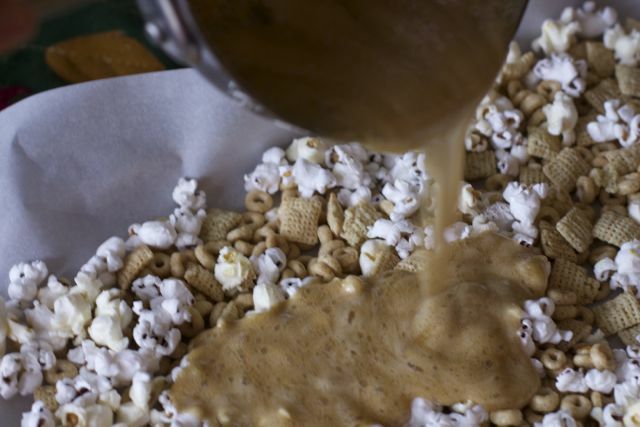 Then make your caramel topping by combining butter, corn syrup and brown sugar, and pour over your cereal and popcorn mixture. Bake and stir. Once it is cooled, you can add your light swords. I thought about adding the marshmallows from the Star Wars™ Darth Vader Cereal, but my kids would not have loved me picking through the cereal box. 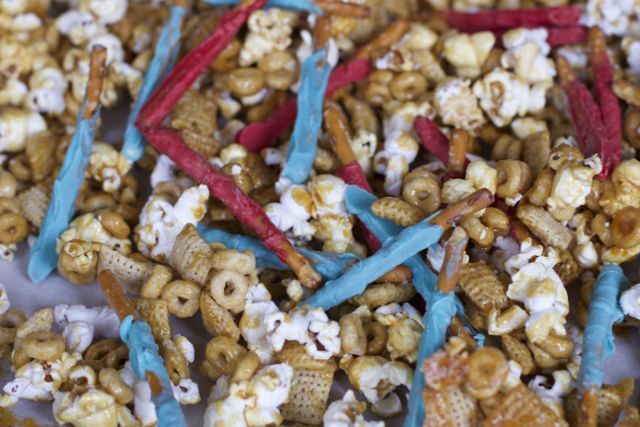 Still, these would have been a fun addition, though the Star Wars™ Popcorn Mix Recipe is already pretty sweet. Add it to a dark bowl to resemble the other side! Don’t send your Star Wars™ fan hungry to the movie release! 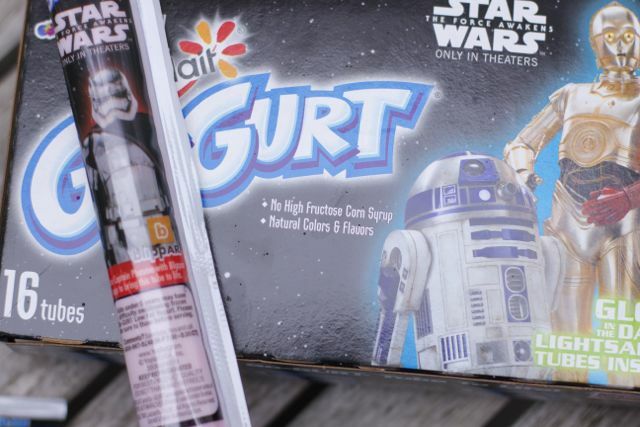 Pair your Star Wars™ Popcorn Mix Recipe with a Star Wars™ Go-Gurt. Just for kicks, I wrapped the bottom with tin foil to make a light sword. Oh, and the box even says they glow in the dark. How fun! 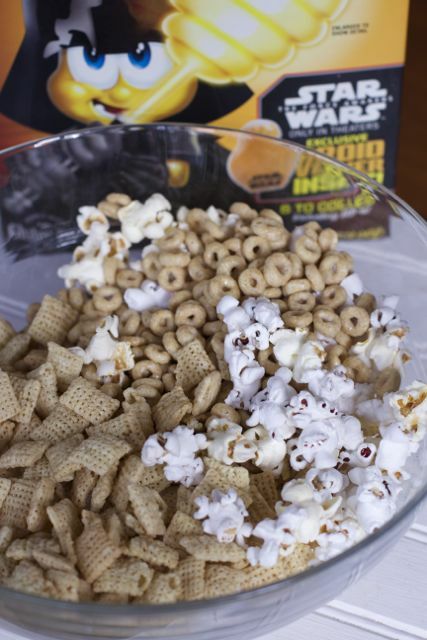 Whether you are an old-school Star Wars™ fan or a new-generation fanatic, be sure to fuel up with this yummy Star Wars™ Popcorn Mix. 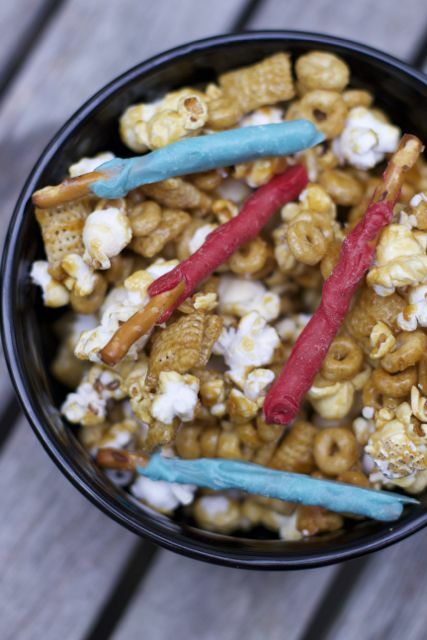 A sweet and salty popcorn snack mix recipe for May the 4th Be with You. Dip pretzels 3/4 the way into a melted colored chocolate. Place them on parchment paper to set. In a bowl mix popped popcorn and cereals. Spread out evenly onto parchment-lined pan. In a sauce pan, combine brown sugar, syrup and butter. Stir to mix and Bring to boil. Let boil for 2 minutes. Do not walk away. Remove from heat and add vanilla and baking soda. Stir until mixed well. Pour over popcorn mixture and toss with a spoon until evenly coated. Bake at 250 for 15 minutes. Take out and stir. Bake for another 10 minutes. Let cool completely. Add your light sword pretzels. What fun recipes will you be making in anticipation for the Star Wars™ Movie? Be sure to pin this recipe for your next Star Wars preview party. 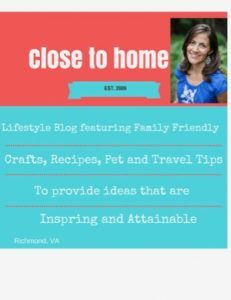 You are also going to LOVE these Posts! I am loving this mix!!! 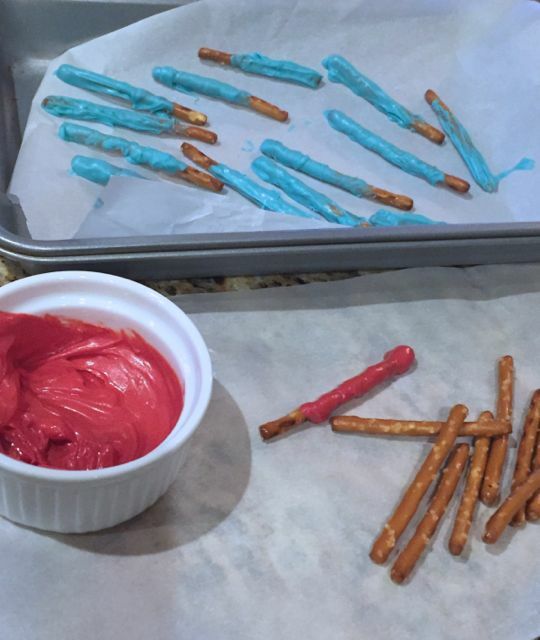 How fun are the light saber pretzels!!! So fun! This is so cool! My little guy would love this. Can’t wait to try this out. My brother would go nuts for this snack! He’s obsessed with star wars and would love to have this while he’s having his movie marathon before the new movie comes out. They look like real light sabers, how cool! My son is completely obsessed with Star Wars, so I am thinking this is definitely in our future!